The Story of the "One HP Heart Pump"
Medical advancements in third world countries are not near as common as in the more "modern" areas. In many cases electronic devices are just not available. 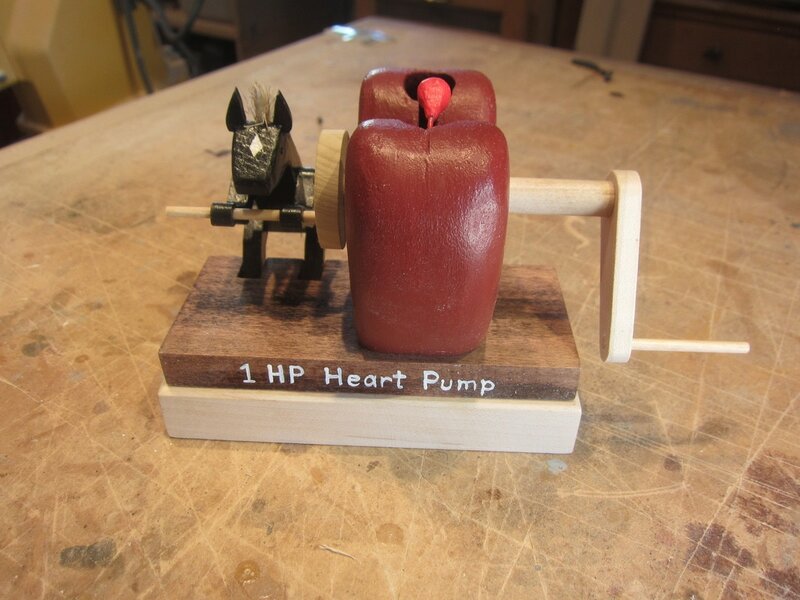 In a move to reach out to the world's poorer areas the Equine Medical Company has developed a horse driven heart pump. It does not depend on electronics or expansive batteries to keep it running. It has been heralded as a unique solution that will deliver wildly needed cardiac care throughout the world. However, to date, no patients have yet volunteered for the unusual operation that is required and the steady diet of hay needed after surgery. Apparently innovation is not always easy. In reality, I had a horse left over from a previous automata project so I decided to make a desktop toy for my daughter who works in the biomedical industry. She now can no longer say that she does not have one of my automata. A collection of a few photos form the construction of the "One Horsepower Heart Pump"